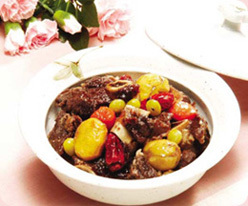 Steamed short ribs, or galbi jjim (갈비찜), is a popular Korean dish often served to dinner guests or on holidays such as Chuseok or Seollal (Lunar New Year). Adored by Koreans and foreigners alike for its soft texture and rich flavor, stewed short ribs contain a variety of vegetables in seasonings so delicious that your guests will surely be coming back for seconds. The mouth-watering sauce is made with soy sauce and other ingredients such as green onions, sugar and sesame seeds that are poured into a pot full of vegetables including mushrooms, chestnuts, carrots, Chinese dates, gingko nuts, radish and other vegetables. The pot is then slowly brought to a boil over low heat, much like how stews are cooked in the West. 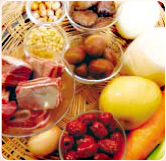 Jjim (찜) loosely translates to “steamed” in English, and is a bit different from Western-style stew. While stew is boiled until its ingredients are barely visible, steamed food in Korea is boiled for a long period for the rich flavor but, unlike its Western counterpart, the ingredients are still intact and are meant to be eaten with the ribs as an integral part of the meal. While it’s acceptable to use any kind of meat, beef ribs are best when making this dish. The first and most important step is to prepare the ribs. The dark skin and fat should be removed from the ribs. First, place the ribs in cold water to drain some of the blood and dark color from the meat. Next, and one of the most important parts in any meat dish, is the marinating. You need to score the meat for it to become tender and for the sauce to really soak into the meat. To cook some truly memorable short ribs, precook the ribs until partially tender, then pour the soy sauce-based sauce and let simmer. While it’s not strictly necessary, if you’d really like to impress your guests before the first taste, you can decorate the steamed short ribs by dressing them with the five cardinal colors (blue, yellow, red, white and black) which, centuries ago, could only be seen on the dishes of aristocrats. As is widely known, consumption of too much fat will lead to high cholesterol and, in turn, can lead to health problems. However, an assortment of vegetables in this hearty dish should alleviate some of the worries of the health conscious. Vegetables or no vegetables, who can resist a dish of soft and succulent ribs for dinner? 1. Cut short ribs into 5cm pieces and remove all excess fat. Leave in cold water for 5 to 6 hours to drain blood. Then, boil the ribs in a pot of boiling water to parboil, then remove from pot and drain fat from the boiled water. 2. Cut all vegetables into large bite-size pieces. For the mushrooms, after soaking in water for a bit, remove the stem and cut into half or quarter pieces. 3. Use a grater to grate the pear for sauce to marinate the ribs, using all the juice from the pear. Take the parboiled short ribs and pour 2/3 of the sauce you’ve made from the above ingredients. Using your hands, mix well with the short ribs and let sit for about 30 minutes. 4. Place marinated short ribs into a pot. Pour the leftover boiled water and pour into the pot of marinated ribs. Bring to a boil on low heat for about 20 minutes. Then, place radish, carrots, chestnuts, mushrooms and the 1/3 of the leftover sauce and pour into the pot of boiling ribs. Boil for another 40 minutes. When the beef short ribs are ready and the sauce has reduced to about half the original amount, place Chinese dates, pine nuts, gingko nuts and mix well with contents in the pot. Remember to continue to mix as the ribs cook. When the sauce has again been visibly reduced from its original amount (remember, it's not a stew and therefore should not have a lot of sauce), place the finishing touches of the five cardinal colors, if desired.